Cape York Aboriginal leader Noel Pearson says the Federal Government's plan to strip Centrelink payments from parents whose children skip school is tougher than the welfare trials currently underway in Queensland. Legislation is before Federal Parliament to freeze welfare payments to parents for three months if their children are frequent truants. Mr Pearson is the director of the Cape York Institute and says he has been at pains to ensure that in the Queensland trials payments are managed, not stripped, from families. "The Cape York approach is that we don't take money away from families," he said. "There is a lot of mention that we [are] stripping people from welfare, [but] nobody loses any money. "A clamp might be put on your money to make sure that you spend it on your children's clothes and so on but our approach does not deprive people of money. "We want to put people in a position where if they are taking responsibility there should be no interference. "It's only where there is a breakdown, where people have failed to send their kids to school or are not abiding by their obligations, that's when there should be intervention." How do miserable people progress in the world? How does this ruthless society work? Amartya Sen, Nobel Prize winning economist, is praised by Pearson for exposing the glaring conceit in liberal thinking that we only have to give people the opportunity to make free choices. If you are not healthy and not educated then you are not in a position to make good choices. Pearson's analysis draws on aspects of both the conventional left and right of politics. To understand Pearson you have to be prepared to think outside of a conventional mindset. If you read Pearson carefully you will understand that he is philosophical profound as well as an effective practical, policy mover and shaker. See his radical centre paper or Charles Perkins Memorial Oration paper. The great failure of "progressive" thinking is that there is no magic mass elevator or social justice forklift. Each individual has to climb the stairs, one by one. Everyone has to climb. Social justice is the sum of individual progress. ecology: Why should indigenous people be more politically correct than anyone else wrt protecting the environment? Why should indigenous people choose to live in poverty because of their cultural heritage? 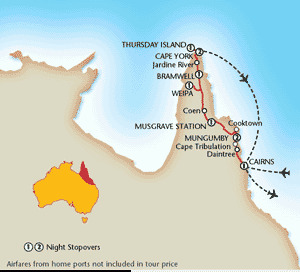 These interventions are currently taking place in four communities in the Cape York Peninsula. There will be no more funding for irresponsible behaviour. Governments and society cannot afford to continue to keep funding drug addiction. Rights (to Land, culture) were an important first phase of Pearson's work but he realised early on that Rights alone would not work, Responsibility is essential too. Pearson has been pushing this for the past eight years. "We've made more progress in the four months of Anna Bligh (Queensland Premier) than we did in the four terms of the Beattie government prior to that"
Progress requires a generational committment across the party politics political divide. If you haven't heard him speak then don't miss the chance to listen to this audio. Pearson talk (59 minutes), Questions (10 minutes). The mechanism put in place in Queensland by the Bligh government is better than that of the Northern Territory intervention, where there is a blanket quarantine of a certain percentage of welfare. "Rudd's educational plans are ridiculous"
Through discussion it was clear that teachers are aware that attempts to lift standards through standardised testing and Leagues tables has been tried already in Britain and the USA - and has failed. One teacher said, "Why don't we try to emulate systems that have been successful, such as in Finland?" Also, Julia Gillard was interviewed on Lateline about the "education revolution" and the interviewer actually asked her some tough questions. What apart from softer rhetoric ("transparency" versus "blaming and shaming") was the real difference between Rudd's and Howard's policies? Could she comment on Rudd's lack of passion when speaking compared to American politicians, such as Hillary Clinton? Of course, Rudd's scheme may have some general public support. Teachers are a much maligned group these days. It's too early to say where this is heading. 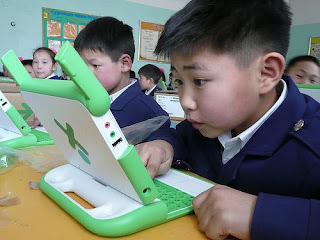 I'm hoping for some discussion of Walter's question 22 and the non universals at OLPC News and/or the learning evolves wiki page. This has the unmistakable appearance of a beautiful, fragrant flower shining in the desert of information overload and systemic separation of theory and practice. I've been thinking about a thumbnail definition for constructionism (with an N, not a V) but when I write it down it keeps growing. I wouldn't like to take out the philosophical, dangerous bit because that would create the risk of too much blindfolded walking. It's better if the word is associated with some risk rather than blandness and the thumbnail definitions tend to gravitate towards blandness through simplification, imply that this is a known known. Bland definitions such as "learning by doing" are mundane and meaningless. a comfortable victim hood view of the world, victims can't get over it: "Trust me I've been a victim and know what you are suffering"
Earlier on Pamela Bone exposed Greer for her lack of solidarity with oppressed Muslim women. The dialectical wheel has turned full circle: Greer from liberator of women to oppressor of women. These are real problems which I believe can be extended to other contentious issues such as the Iraq war (Iraq is now finally emerging as a democratic state) and the alleged environmental catastrophe. It's easy to fall back on long held beliefs that add together to become a world outlook, it's easy to avoid the hard yards of rigorous analysis, it's easy to be a comfortable victim of forces so powerful they are hard to deal with, it's easy to seek attention with short blog posts like this that ride off the hard work of others. It's hard to be objective, really hard. In this case, it's clear to me that Marcia Langton has done the hard yards and Germaine Greer has not. Read her essay. What Alan Kay said about his Universals / Non Universals slide at the EuroPython 2006 keynote (transcribed by me from source). I've started a new page on the learning evolves wiki whose purpose is to expand and elaborate further on the meanings and educational implications of the list of non universals. Being accurate about what Alan said seemed to be a good place to start. If you look at these you can see our modern internet culture - it's basically social, it enables us to communicate in various ways and so forth, basically a story based culture"
These are a little harder to learn than the ones on the left because we are not directly wired to learn them. These things are actually inventions which are difficult to invent. And the rise of Schools going all the way back to the Sumerian and Egyptian times came about to start helping children learn some of these things that aren't easy to learn. It can be argued that if you are trying to be utopian about education what we should be doing is helping the children of the world learn these hard to learn things. Equal rights is a really good one to help children learn. No culture in the world is particularly good at it." "In the meantime, the old rights-based progressivism in indigenous political thinking had a few more years to go before a relentless decline in the standard of living and safety of people in Aboriginal communities forced so many of us to ask an appalling question: Why did this descent into a seriously dysfunctional state seem to coincide with liberal progressive policies based on the rights agenda, and the creation of new degrees of community autonomy? The taboo on raising this was finally broken by an avalanche of evidence no one could ignore"
"The issues now included welfare dependency, community autonomy, organisational corruption, the future of the Aboriginal and Torres Strait Islander Commission, frontier history wars, racially differential morbidity and life expectancy, poor school attendance, declining literacy and numeracy, substance abuse, violence against women, child sexual abuse, customary law as a criminal defence, staying in versus leaving versus orbiting in and out of the ghettos, service mainstreaming, gang warfare and public rioting, the entry permit system and restrictions on media access, the future of funding for remote settlements, and the imminent expectation of rocketing urban migration by Aboriginal people leaving failing outback communities"
"We have tended to be protective of the people with whom we have worked, to the point where the recent descent of so many places into dire conditions seems almost scientifically inexplicable"
"Truth is not necessarily a good uniter of people. Fictions or simplifications so often better bind us, at least for a time"
(22) What “shoulders of giants” should we stand on? What is it that children should learn? Are there any universals? How do children decide whom and what to believe? I've been providing what I think is a good answer to these questions for some time now (since December 2006: what should schools teach?) but often the response is muted and contradictory. It's not my original answer, it originates from alan kay and his analysis originates from anthropologists. The resolution of the tension (between how children learn and the complex, non spontaneous nature of the development of advanced scientific or Enlightenment ideas) is to develop an honest children's version of the advanced ideas. For some of these ideas (not all) the computer can aid this process. Which ones? The list would include the laws of motion, turtle geometry, calculus by vectors, exponential growth, feedback and system ecologies. I think this should be the starting point or at least one of the starting points for thinking about how computers should be used in schools. I've been wondering why this particular idea, the non universals, is not spreading more. I think it's because it goes against the culture of pseudo progressiveness which advocates that process is more important than content, that discovery is more important than knowledge and/or that education should be entertaining or at least laid back, that we shouldn't put too much pressure on children. The problem is how to teach the non universals without sounding like a "back to basics" fundamentalist. But that is a real problem that needs to be faced and resolved. Is this an example of the unsane, the mental state where our ideas don't fit reality, the map doesn't represent the territory. We like to think of ourselves as mostly "sane" and contrast that with a few "insane" personal moments or the more permanent state of a few unfortunates. But the "unsane" idea makes room for a different self perception. What if more often than not we are unsane? Seymour Papert asked a number of probing questions about the nature of School and the use of computers in School, which originated from Piaget's ideas about how children learn and which initially focused around a piece of software or "object to think" with called logo. I see Walter's list as continuing in this tradition with some updates involving issues arising from networking, the prospect and new reality of far cheaper, mobile computers, the FOSS model, the need to scale learning democratically and others. Some of the questions strike a strong chord with me (eg. 2, 9, 10, 11, 14, 18, 22) whilst others push me in the direction of the need to expand my areas of knowledge or expertise. For me, the main point is not that the questions are the best possible questions or whether the categories are correct but the meta issue that new innovative hardware / software (OLPC or Sugar as "object to think with") creates the need for thinkers to step forward and ask questions like this that span multiple disciplines (computer science, engineering, education, economics and social sciences). We need polymaths. I think the stage we are at is getting the questions right as well as the answers - that walter's act of modelling such a process would bear fruit if others took up the same challenge that he has taken up, to be a grass roots intellectual spanning disciplines as well as having expertise in particular domains. In many ways this is going against the dominant trend of intellectual discourse (truth slips from view ... ), so I'm grateful to Walter for giving it a try. But threatening a “Genocide Olympics” alone will not bring peace (or peacekeepers) to that troubled region. No amount of criticism will convince Beijing to pursue a coercive strategy and a nonconsensual deployment of U.N. peacekeepers that Khartoum rejects. Yes, China has the economic leverage to gain the ear of President Bashir, but that hardly means it has the ability—or, more to the point, the will—to bully him into accepting a large U.N. peacekeeping contingent in Darfur. China’s multibillion dollar investments in Sudan’s petroleum industry are a much-needed source of energy for its mushrooming economy. Beijing may make tactical moves to pressure Sudan, but it will not choose human rights over oil, a matter of paramount national interest. And, even if China were capable of delivering Bashir, the Sudanese government is not the only impediment to an effective peace process. Nowadays, more people may well be dying from tribal clashes than from marauding janjaweed or government forces. The infighting of fractured rebel groups and the sheer number of displaced people with no homes to return to are also immediate and significant obstacles to peace. But China has little influence over the rebel movements and is ill-positioned to act as a mediator between them. Nor is China a good choice to be our moral compass. The West embraces human rights and international humanitarian law, but China emphatically does not. The continuing crisis not only threatens the lives of millions, but the weak Western response undermines those grandiose principles such as the “responsibility to protect” — hallmarks of our international moral code. Moreover, it is the U.S. government, not Beijing (nor the U.N., for that matter), that has invoked the label “genocide” to describe the Darfur crisis. Morally and legally, the responsibility to lead is America’s. Ending the Darfur conflict requires much more than what China alone can offer. Rhetorical flourishes from world leaders, limited Western unilateral sanctions, and promises of firmer action at some indeterminate time in the future are also patently insufficient. Only a top-level, sustained, and aggressive multilateral mediation effort backed by the United States, the European Union, and African, Arab, and Chinese governments can stop the violence and reverse the massive displacement of people. Noel Pearson has been more subdued publicly since the election of the Rudd government, with far fewer opinion pieces written for The Australian. I have been fearful that real indigenous policy reform, which Pearson leads, might have stalled at the Federal level - despite the ongoing welfare reform gains in Queensland. Pearson and Rudd have an antagonistic history going back to Rudd's "Dr Death" days in Queensland politics. So, it's great to see today's announcement about an initiative from Andrew Forrest (Australia's wealthiest person) to guarantee 50,000 indigenous jobs within two years. And that this initiative has the full support of the Rudd government. A work opportunity covenant should be available to any indigenous person whether living in Blacktown, Sydney, or Aurukun, Cape York. Wherever an individual seeks to climb the staircase to a better life through work, they should be backed. If you can imagine the first steps on a staircase, with the first step being higher than the second. This first step upon which too many of our people are situated we call the welfare pedestal. The price on this pedestal is higher than the price on the real staircase: that is why our young people choose to stay there. Remaining on welfare, under the prevailing incentives offered by the welfare system, is a rational choice. The problem is that the small comforts of the pedestal become a permanent destination. And our people are perpetually condemned to missing out on sharing in the country's wealth, not least in the mining boom occurring in our back yards. So it is the first step downwards that is the most bracing step. It requires a decision on the part of communities to embrace welfare reforms so that our people can step down from the pedestal and start climbing the staircase of opportunity. Four communities in Cape York Peninsula have charted these reforms for their people. Even where communities have yet to embrace welfare reforms, the Rudd Government should enable individuals - wherever they are - to opt in to welfare reforms that apply to them as individuals. A work opportunity covenant should represent a deal between an indigenous individual, a corporate employer, and the federal Government. Under this covenant, the individual would commit to certain welfare reform conditions, the federal Government would commit to providing training and other support, and the employer would commit to the guaranteed job opportunity. At the end of the press conference, Mr Forrest gathered Mr Pearson, Sir Rod, Mr Mundine and Mr Rudd into a semi-circle and called on them to place their hands on top of his. When they did Mr Forrest, said: "This is the Australian Employment Covenant." Minsky argues that to explain intelligence we need to integrate both of these approaches and not take an either / or attitude. The popularity of a connectionist only approach has retarded research into intelligence. This helps me situate the work of Rodney Brooks (behavioural AI) as important but limited. Young Australian indigenous students have a far better chance of success in life if they leave their remote communities and attend boarding school in the metropolis. Sue and Bucky kept looking after me and I became a part of their family and they adopted me, due to the thumbs up from my mum. I could tell Rebecca, my adopted sister, things I hadn't told anyone before and I wouldn't understand why she would get all emotional and start crying. I have moved away from my family to attend this fine school. I am the first person in my family to have received my School Certificate. I have travelled overseas … I am determined to finish year 11 and 12. I will be the first person in my family to receive my Higher School Certificate and maybe even the first to attend university. It wasn't until I started going back over my life that I truly realised exactly how far I have come and how much further I can go. "The problem with politicians getting to know the issues in indigenous townships is that we tend to suffer from what Aboriginal people call the 'seagull syndrome' — we fly in, scratch around and fly out ... You learn a hell of a lot more living in a place than just going in and talking to people about what it's like"
Sadly, this down to earth, commonsense, gutsy action by an Australian politician strikes me as so extraordinarily unusual that I feel compelled to draw attention to it. This paper discusses (a) the role of cognitive and noncognitive ability in shaping adult outcomes, (b) the early emergence of differentials in abilities between children of advantaged families and children of disadvantaged families, (c) the role of families in creating these abilities, (d) adverse trends in American families, and (e) the effectiveness of early interventions in offsetting these trends. Practical issues in the design and implementation of early childhood programs are discussed. If you don't have time to read the whole thing (I haven't read it yet) then read the 15 point summary in the introduction.